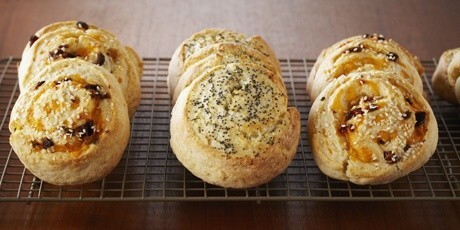 In episode Scones & Biscuits of TV show Bake with Anna Olson prepares Anna Olson recipe for Savoury Spiral Scones. 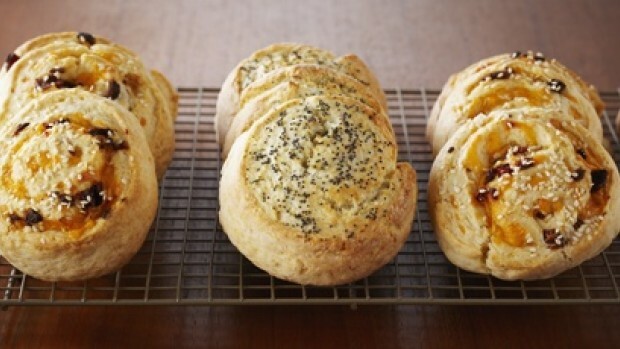 Scones - Preheat the oven to 375 F and line a baking tray with parchment paper. ift the flour, sugar, baking powder and salt into a large bowl. Cut in the butter until the mixture is rough and crumbly but still small pieces of butter are visible. Filling Option 1 - Bacon, Sundried Tomato & Cheddar - For Filling Option 1, Sprinkle the dough with the bacon, sundried tomato and cheddar. Roll the dough up tightly from the 10-inch side. Filling Option 2 - Garlic Cream Cheese & Dill - For filling option 2, beat the cream cheese with the garlic and dill and spread this over the dough. Roll the dough up tightly from the 10-inch side.